A man set adrift by a storm wakes up on a deserted island. 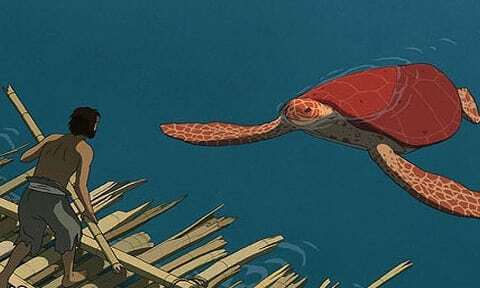 He builds rafts from bamboo and attempts to sail away, but each time his raft is destroyed by a red turtle, forcing the man to swim back to the island. In revenge, he hits the red turtle on the head with a bamboo stick, and pushes it over on its back, but. halfway through building yet another raft, the man starts to feel guilty about what he’s done, so he catches a fish and tries to feed it to the turtle, but finds that it has died. The turtle’s shell splits down the middle during the night, and to the man’s surprise, it turns into a woman…. 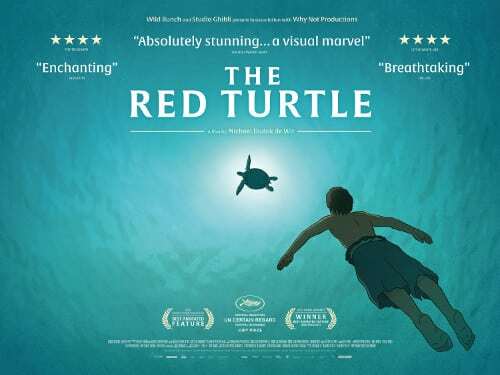 The Red Turtle supposedly came about because Hayao Miyazaki saw an animated short called Father And Son and was so impressed that he immediately sent head of Wild Bunch Productions Vincent Maraval to find its director and offer to make a feature film with him. The result is a truly exquisite work that is on the surface simple, even minimalist, but is full of philosophy and deep themes if you like a bit of brain food in your movies every now and again, though they’re quite subtle and even vague at times – in fact if you go and see this film, or have already seen it, you may very well come away or have come away with different thoughts of what it’s all about to me. Hopefully though, you will agree that this is another wonderful example of the unique artistry that constantly comes from Studio Ghibli, though being that it’s more a co-production than a fully fledged Ghibli effort [something that can be picked up by the way that the Ghibli logo line drawing of Totoro is present and correct but that the background colour, rather than blue, is red], the film’s look and feel is closer to some European animated movies like the delightful work of Sylvain Chomet [The Illusionist, The Triplets Of Belleville]. In fact the way the human characters seem to be unfinished reminded me most of the drawings of Tintin creator Hergé, and this device may very well take a bit of getting used to, as well as the muted colour palette that is not employed everywhere but which certainly dominates – oh, and the lack of dialogue. I’m sure that someone said: “Hey” at some point, and there are some non verbal expressions uttered elsewhere, but actual words are not spoken. This is a very brave decision by director Michaël Dudok de Wit and his co-screenwriter Pascale Ferran, especially considering the minimal detail on character’s faces, but after a while you cease to miss it, and while there may be a lot to think about, the story is always easy to follow- never are you left in doubt as to what has occurred. 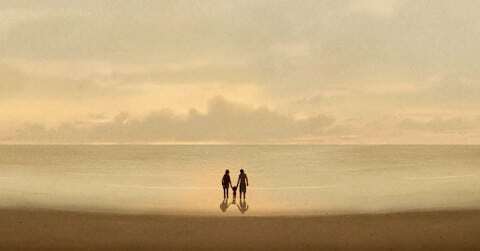 In fact, I would say that the absence of chatter adds to The Red Turtle’s magic, and the existentialism is similarly enhanced by the fact that the characters don’t even have names – in fact we don’t even have a clue as to when or where the events depicted are actually taking place, and by the end [whilst may I add I was trying to fight away the tears] I realised that never did I miss these details, and how they just weren’t important. And the aural aspect is certainly not ignored overall – the sounds of nature consistently make themselves heard, and there’s a fine orchestral score by Laurent Perez Del Mar that sometimes sounds positively Ennio Morricone-like during some of its best moments which employ a wordless female soprano – though silence is also employed effectively in places. Unlike in most castaway stories, we first meet our ‘hero’ already being tossed about by huge waves, the circumstances of how he got to be stuck in the ocean not given to us. He manages to get to an island, and as these things go it could be worse. There’s plenty of fruit to eat, a large pool of water to drink from, small animal inhabitants who just seem to want to get out of the way, sandy beaches, and a bamboo forest from which he can build a raft. Of course there is danger: a very tense sequence early in the film sees the man fall into a crevice and swim the length of a claustrophobic underwater tunnel to escape, though scenes of peril of this nature are few and far between because the story just doesn’t need them. In any case, the man dreams of bridges leaving the island and string quartets appearing on the beach, and keeps trying to sail away – only to be thwarted every time, the cause of this turning out to be a very large bright red turtle which certainly stands out amidst the more naturalistic hues and more realistically depicted creatures elsewhere [some crabs may act a little anthropomorphically and function as comic relief, but they certainly look and move like real crabs]. The turtle does this because, I think, it knows that the man’s purpose is to remain on the island, and that he has to surrender the instinct to escape his circumstances and learn to embrace them. The furious man however kills the turtle, but his regret at what he’s done brings forth a miracle in the form of a human woman, and this is where the film really does become far-out fantasy, unless of course you consider that he imagines all this, and there are certainly things in the film that may substantiate this theory. The absence of words seems to magnify other things, just like how so many people who are, say, blind, have other senses enhanced. When the woman reaches out her hand and touches the man’s cheek after his months of loneliness, we can almost feel it. And one feels like Dudok de Wit has totally earned the right to lapse into over the top romantic cliché when falling in love is depicted with bright light and bodies floating into the sky, though a couple of flaws in detail, such as when clothing that has just been completely submerged in water continues to blow around the wearer as if it is bone dry, rather than it sticking to him, are notable and really rather odd considering the care employed elsewhere. The plot progresses like a hallucinatory variant of The Blue Lagoon as we are made to think about how we are [or should be] one with nature, while sometimes being reminded also of nature’s cruel quality, notably during a tsunami sequence which, because of the relative lack of what we tend to call ‘action’ previously, is as exciting as they come, though overall this is quite a tranquil picture. Some may indeed find its 80 minutes slow, but then we are so used to our English language cartoon features and their frantic pacing. And I actually think that many small kids would get a lot out of this film if they were given the chance of seeing it. They may also pick up, in their own way, on the themes of the circle of life, of companionship, of making the most of your circumstances, if not in the same way us adults may do. The animation seems to be chiefly hand drawn, though I think I noticed some CGI being employed here and there, and that’s fine when the makers of films like this are still flying the flag for the traditional ways of doing these things, albeit filmmakers outside of Hollywood which is all-CGI cartoonery now [why, Disney, why?]. Simplicity is the key to the success of some of the best sections of The Red Turtle, like the nocturnal bits which take place in grey, something which sounds dull but which actually creates a world which is totally captivating and rather haunting. It’s interesting that, right from the beginning, the man has no control over events and by the end finds little resolve on that front, but then Dudok de Wit almost seems to be trying to redefine the animated movie – to do new things with it – with this film anyway, and however you interpret matters – or try to – or don’t attempt to do so at all and just take everything at face value [parts of the story are obviously influenced by folk tales both Asian and European], your mind will probably move to have you thinking about life, and what’s important in it, and about our little spot in this world. Despite a few minor inconsistencies and odd visual choices [the underwater scenes are curiously dull and feel like a missed opportunity], Dudok de Wit has made a true gem here: multi-layered yet elegant, intelligent yet in my opinion totally accessible to those willing to take a break from Pixar, Dreamworks and Illumination [and I do like many of their films too]. Ghibli’s faith in him was totally justified. As to whether he’ll be able to continue with hand drawn animation now Ghibli seems to have shut up shop is another matter, but I cannot wait to see what he does next. And it ends in the best possible way: heartbreaking, yet poetic and challenging our human-centric views and our minds even further.